← Great Sponsorship Debate- Suggestions? My time in Portland Oregon was tremendous as you all already know if you have read any of my posts over the last week, but there is an aspect that I must address. The city of Portland public transit. Portland is well-known as the crown jewel of bike-friendliness and it lives up to the hype. A great example is the culture of bike riding in the city. It can be best summed up by a statement from a good friend of mine who lives there. This guy was one of my best friends during my freshman year in Northern Vermont and we both used to sit around day dreaming about snowboarding for a living but he actually did it. He got a job at Burton designing boots and a few years back moved to Nike and relocated to Portland to design their boots and basically travel the world riding his creations. Needless to say, that is AWESOME! But it was what he said about the bike riding culture in Portland that struck me. It seems that when you move to this city, there is extreme peer pressure to get a bike. If you don’t have one, you are best served to not mention that and get one asap. He admittedly doesn’t like riding bikes but needed to get one in order to fit in to the Portland culture. More importantly, I wondered how that is possible. The answer is INFRASTRUCTURE! The Portland public transit system is called the TriMet that combines buses, MAX light rail, WES commuter rail and streetcars. I only got good exposure to the MAX light rail system and it was great. 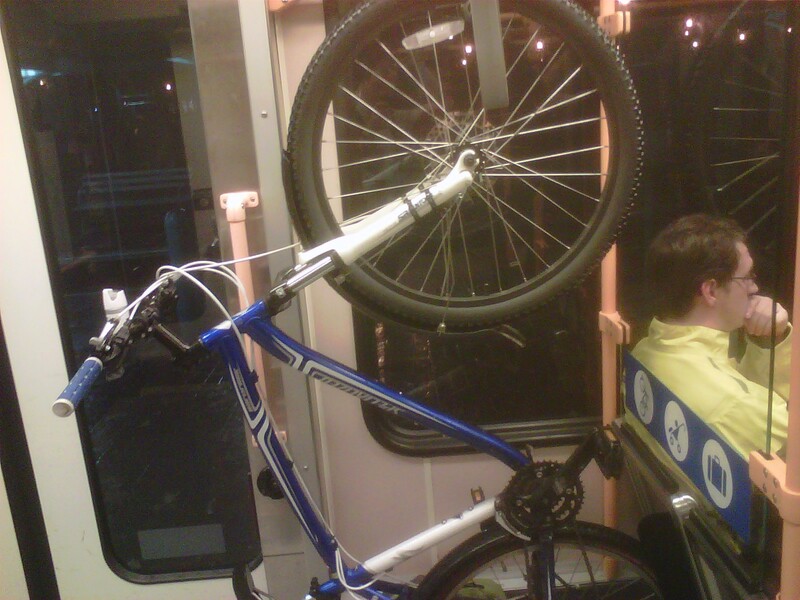 Each car has designate bike areas, with vertical mounting hooks so that the bikes are secure, take up less room and can be easily moved on and off the train. This is an easy design feature that could be incorporated anywhere but isn’t what seems to make biking a required cultural element. That feature is a combination of this feature with a designated “Free” Zone around the city. Yeah, I said FREE! As the map shows below, the area shaded in yellow is FREE to travel in. You get on the train, go to your destination and it’s FREE! You can imagine the confusion when 2 Massholes and a Northern Californian gentleman from Clark tried to figure this out. We kept reading the ticket machine over and over. We could plainly see the map outlining that we would be traveling within the FREE zone but it just wouldn’t compute. Eventually, they got it, but I was convinced there was a “catch”. The idea of free public transit inside the busiest and most necessary areas was so foreign to me I finally had to put it out of my mind until today. Apparently this system works and from what I could tell its cleaner and more reliable than the “T” in Boston and a stuff they call “public transit” in Worcester. So, if you want to know what a city needs to do in order to get people out of cars and on bikes, buses and trains. The answer is logical infrastructure. This entry was posted in Bike commute, Car Free, Urban Bike and tagged Boston, CarFreeBrad, CarFreeBrad.com, MAX Light Rail, Nike, Portland, Portland Oregon, Public transport, TriMet, Worcester. Bookmark the permalink.